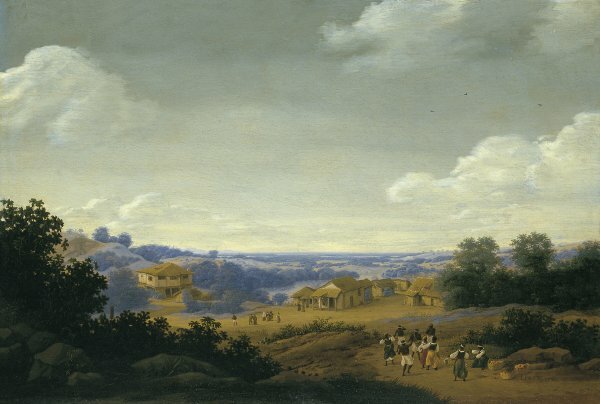 This panoramic view of a plantation settlement in Brazil was recollected by Frans Post one dozen years after he had returned from South America to Holland. It depicts the master's residence on the left and smaller dwellings including a chapel in the centre. The foreground typically is filled with rocks and the silhouetted forms of lush trees and shrubbery, while the settlement creates a strip of tan earth in the middle distance before a verdant and misty plane. 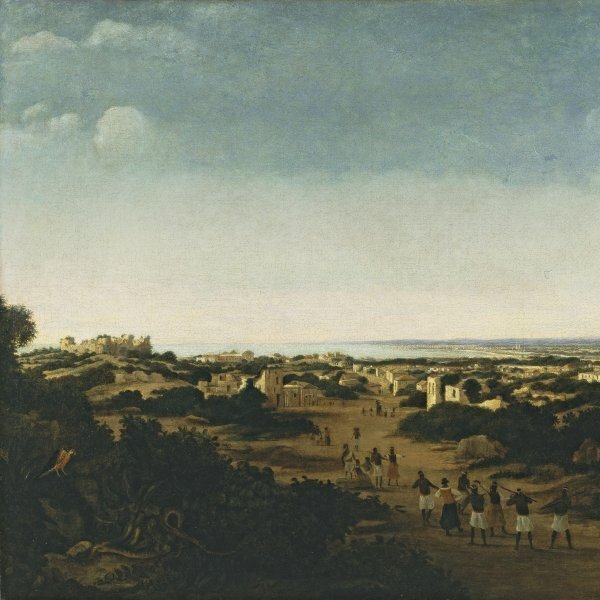 A tall, cloud-swept sky enhances the expansive panoramic effect. Post often varied favourite designs and themes, notably wide tropical river valleys and panoramic forests with settled clearings. Gaskell (1990) observed that a painting by Post closely related in composition to the present picture but reportedly dated 1649 suggests that the genesis of the ideas for this painting had appeared seven years earlier. Plantations of varying sizes make up the largest portion of Post's production as a landscapist. In the present work he depicts a modestly scaled plantation, probably Portuguese in nationality (note the priest and friar before the chapel) in all likelihood devoted to the cultivation of sugar cane. Post depicted much larger sugar plantations, known as engenhos reais and described first hand in such works as Antonil's Cultura e Opulência do Brasil (Lisbon, 1711). In his landscapes he depicted in detail the lucrative sugar production industry, including its mills and boiler houses. However the present work celebrates the land, its sweep and beauty, as much as the plantation and its simple labourers' dwellings. Indeed with the colourful marketplace and dancing natives in the right foreground it seems less an account of industry and cultivation in the New World than a vision of the leisured existence in exotic foreign lands. Gaskell rightly questioned whether its appeal was to arcadian stereotypes.